I’m an energy healing facilitator and professional artist. My “magic hands” are a source of energy balance, pain relief and artistic delight for friends, family, collectors and clients. 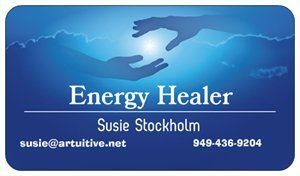 My goal is to work in partnership with you to upgrade your body’s energy, thereby creating balance and comfort. The point is to change the host (that’s you) so that disease no longer recognizes it. Quantum-Touch™ works with plants, animals and people. 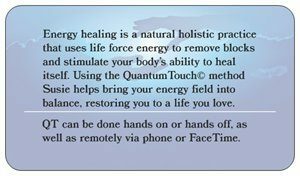 My training includes Quantum-Touch™ Level 1, Level 2 and SuperCharge. Contact me for an appointment at the email and phone number above. It would be my pleasure to work with you – in person or remotely.